Who doesn’t love a warm and creamy risotto on a winter’s night? 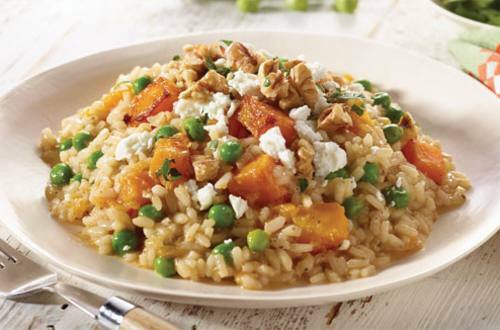 The pumpkin gives this dish a delicious sweetness, which tastes divine with the salty feta. Yum! 1 Heat oil in a large pan. Add pumpkin cook for 3-4 minutes until just starting to brown. 2 Add Risotto and water; stir to combine. Bring to the boil, reduce heat to low and cover with a lid. Simmer, without stirring, for 15 minutes or until almost all the water is absorbed. Scatter peas over rice, replace lid and cook for a further 5 minutes until peas are tender. 3 Remove from heat, divide between serving bowls and top with walnuts, feta and parsley.